There’s an old circuit judge in one particular county court who is loathed by both OldSmoothie and HeadofChambers in equal measure. Some say it’s because he stole girlfriends off both of them at university. Others that they are jealous of his success both in his practice at the bar and in the way he has progressed up the hierarchy of his Inn. Their own side of the story is that they fail to understand how someone who (even) they out-performed at Oxford can have progressed with such ease. In other words, it’s the big fat green stinking jealousy monster that’s been eating them up for years on end and minor academic victories from the past are all they have to cling on to. Anyway, one of the pupils went to watch them both appear in front of the judge yesterday and reported back afterwards. Apparently the two of them thought it was all a might fine jape and in light of their view of the judicial intelligence had a competition as to who could get the most references to the word “thick” into their submissions. You get the picture and it was a mark of the judge’s great patience that he didn’t flinch at the increasingly obvious digs which were being made. Then, at one point, seeking further to underline his ostensible intellectual superiority, HeadofChambers referred to a textbook he had written a few years earlier. Though when I say written, what I really mean is put his name to a book TheCreep had in fact written. “It used to be the rule that books were only referred to books after the author had passed away,” said the judge. “Ah, yes. Reports of my death are greatly exaggerated,” said HeadofChambers looking more pompous and self-satisfied than ever. The two of them stared at each other. 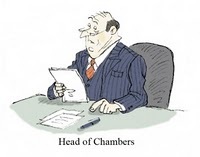 HeadofChambers was clearly weighing up the cost to his pride of the hands on the head option as against the likelihood of losing one of his few remaining solicitors if he had to ring and tell her that he was stuck in jail until tomorrow. Eventually HeadofChambers blinked and the time was served in the naughty corner. BabyBarista is a fictional account of a junior barrister written by Tim Kevan whose new novel is Law and Peace. For more information visit and to read past posts visit babybarista.com. Cartoons by Alex Williams, author of 101 Ways to Leave the Law.